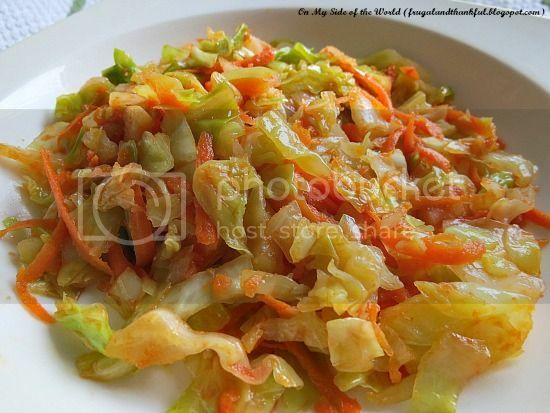 Frugal and Thankful: Stewed cabbage?? As I was organizing our fridge on Monday, I discovered a head of cabbage that needed to be used, and a childhood recipe immediately came to my mind. Growing up, my Mom always shopped in season. And in winter beets, turnips, carrots, potatoes and cabbage were usually what we ate. I've already mentioned before why I think cabbage is a great addition to any menu, and this recipe is a hands down classic. My Mom made it at least once a week in winter months when I was little. I really had a hard time thinking how to translate the name though. The closest I could come up with is "Stewed cabbage". It does taste better than it sounds, I promise. I have a disclaimer to make: the original recipe is usually made with onion. But my hubby is not a great fan of onions, so I skipped it for this recipe. But if you want to add, just saute it in oil on medium heat for 5 minutes before you add other veggies. It's tasteless and you can buy it at any major store (I got it from Walmart). Again, because I don't fry food much, this bottle lasted me for more than three months, and I still have some left. The other good options are peanut or grapeseed oils. There is a debate about using coconut oil because it's also high-heat resistant but it has a very distinct taste. I'm still using olive or canola to add to dishes, just not for frying. Now, that you added it to the frying pan, cook on medium-low stirring often until soft but not burned. Don't be tempted to use higher heat because your cabbage will burn. 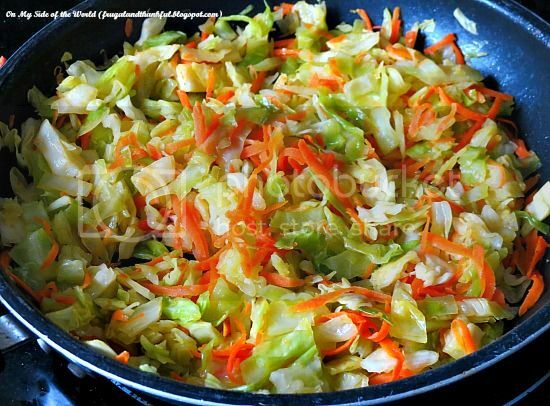 This cabbage makes a great and healthy side dish. On our most lean months, my Mom would serve it with just a baked potato but you can also cook some meat and add to it for a full-size meal. I might or might not have eaten half of this frying pan by myself... Yum! This cabbage looks very tasty. I love cabbage. Please can you clarify they tomato sauce - Is it ketchup or the type of sauce you would use when making pizza or pasta? Thanks, Lena, will have a go at making this. Sounds good! Thanks for sharing! I confess to loving just plain steamed cabbage, so this sounds delicious. I will be making this soon! I made something kinda similar back when cabbage was on sale and it was delicious. Mine was a soup with cabbage, carrots, and polish sausage sauteed briefly in butter, then put in chicken broth with caraway seeds and simmered until completely soft. I can't remember if I also used onions or just seasonings. It was a "what's on hand" meal but my male friend and I liked it a lot. We also ate a lot of cabbage as kids (Mum was a very thrifty cook who was born in 1925, so learned to cook during the Depression... plus they were quite poor, grew their own and cabbage grew well their marginal soils). This recipe must be one of those "simpler is better". I don't think we ever had this particular combo, so I am eager to try. I admit I will probably add herbs, which are like salt and pepper to me (I have a hard time to cook ANYTHING without some dried green stuff getting involved LOL). Thanks for the cooking inspiration, Lena! 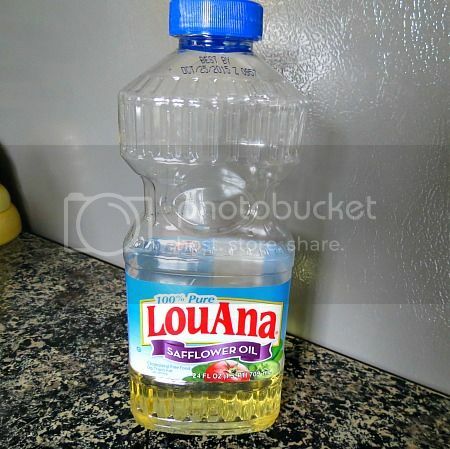 For anyone wishing to switch cooking oils (my faves are sunflower and grapeseed), for the sake of taste it is a good idea to gradually substitute partial amounts until your family becomes accustomed. I love peanut oil but save it for a finishing taste at the end of cooking. 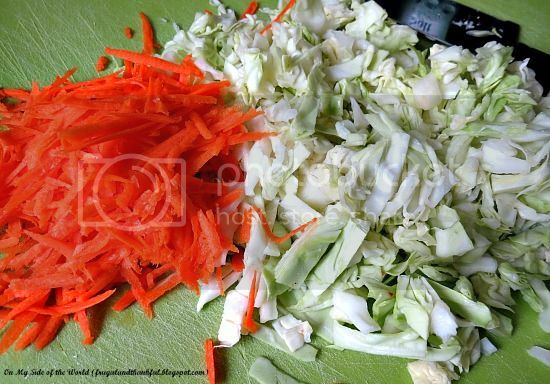 I notice that you stir fry a lot of the veggies in your recipes whether or not it's a formal stir fry recipe. That's a different style for me. I grew up eating a lot of boiled cabbage and ham. Also, had it raw a lot. I like cabbage no matter how it's cooked. Do you think that this recipe would be tasty if I baked it in the oven instead of cooking it stove top? 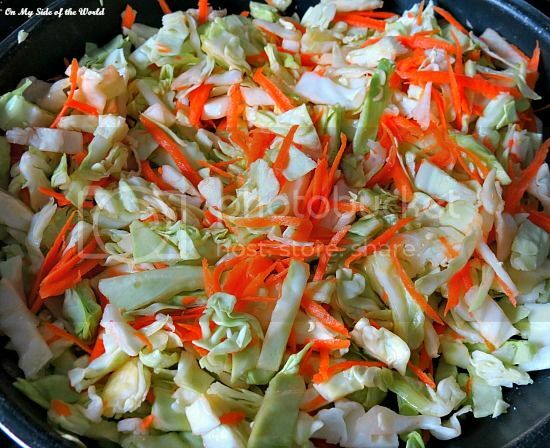 Your recipe looks delicious Don't know why, but I never thought about carrots cooked in with my cabbage. I like baking shredded cabbage in the oven. I usually add a little seasoning salt to it and a couple of pats of butter chunked up in little pieces. I've cooked onions with cabbage before but never added carrots, or tomato sauce. I'll be trying this very soon. I had a "lean" week a couple of weeks ago, because I had a toothache and could only stand to eat soft food. I had a baked potato, (smashed), and cooked until totally tender cabbage for dinner that week. It tasted so good. My husband doesn't like cabbage, so yes, I ate half of a cabbage and a baked potato twice for dinner that week. I can easily imagine how one person could eat half a pan of your cabbage. It looks better than it sounds too. Great recipe, thanks! That looks great! I grew up eating a lot of purple cabbage. © Copyright 2012-2014 at On My Side of the World. All of my designs and ideas are intended for personal use only. All borrowed content must be linked back and properly credited to On My Side of the World. Feel free to follow my tutorials but please make a proper acknowledgement on your post to my blog by name and include a direct link. Use only single image files and excerpts of 100 words or less for external uses. Republishing posts in their entirety is prohibited without permission and will be seen as a copyright violation.